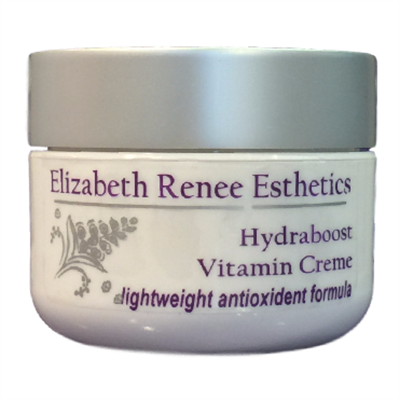 Hydraboost Vitamin Creme by Elizabeth Renee Esthetics improves moisture retention. Rich in anti-aging vitamins, antioxidants and water-soluble blends of silicon complexes, this lightweight yet nourishing creme protects skin from aging free radicals while creating a moisture reservoir between skin cells that lasts up to 20 hours. Timed-released for maximum benefit, this anti-aging formula instantly smooths dehydration lines and is designed to work for all skin types without clogging pores or contributing to blemishes. Helps restore firmness, making skin more resilient throughout the day and over time. Silky smooth and weightless, this pale yellow cream glides easily over the skin, leaving just a touch of the essence of jasmine. Smooth over clean skin, morning and/or night. To reduce friction and help prevent redness that can occur during application, warm a dime-size amount of Hydraboost Vitamin Creme between your fingertips and lightly pat into the skin.